An adaptation of four famous French short stories for intermediate students "Histoires celebres" (de Roussy de Sales) introduces four French masters of the short story--Daudet, Zola, Maupassant, and Theuriet. Each author is represented by one of his most famous works, adapted to fit the needs of the intermediate classroom. Questions following each story encourage the active use of French. This reader is softcover, 6" 9," and 48 pages in length. 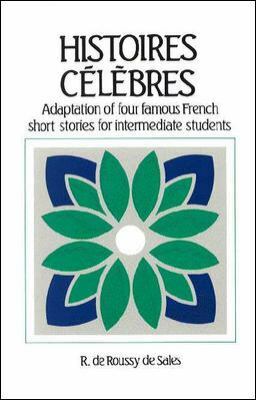 An audiocassette is also available.McGraw-Hill, Glencoe is the author of 'Histoires Celebres Adaptation of Four Famous French Short Stories for Intermediate Students' with ISBN 9780844214047 and ISBN 0844214043.